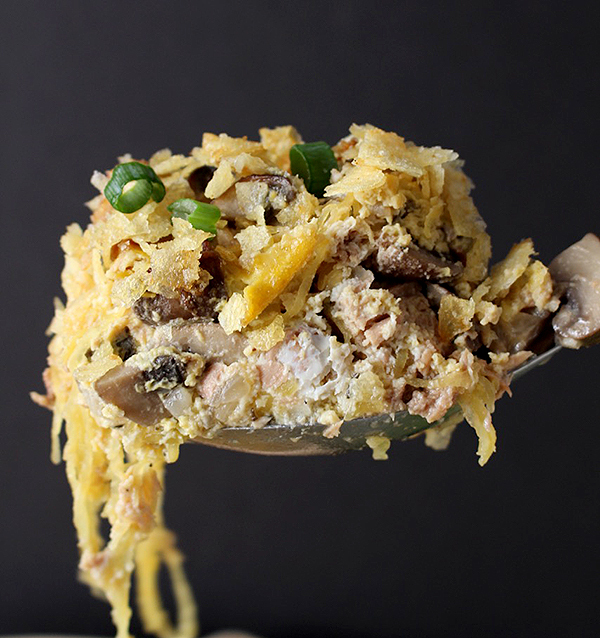 This Paleo Tuna Noodle Casserole is a healthy version of the popular dish. Made dairy free, gluten free, and Whole30- but still delicious and comforting! Just a warning: this is not the most pretty dish in the world!! 🙂 It is loaded with flavor and veggies and makes a great dinner, though! Tuna Noodle is such a classic dish that most people grew up on. I switched out the cream of mushroom for an easy homemade version that is dairy free, and used spaghetti squash in place of the egg noodles. The results are an amazing and one of the only ways my husband will actually eat tuna. I do recommend buying tuna that is line-caught to protect endangered species. Wild Planet is a great brand and it’s easily found at grocery stores- not just health food stores. So, this is a Whole30 meal only if you leave the chips off. I know- I’m sorry!! Nothing fried on Whole30 though. I’m thinking an almond flour/fat crumble would totally work though and still be delicious. Speaking of the chips- Jackson Honest are my favorite. They are fried in coconut oil and have only 3 ingredients: potatoes, coconut oil, salt. That’s it. This isn’t sponsored, I just truly love them! 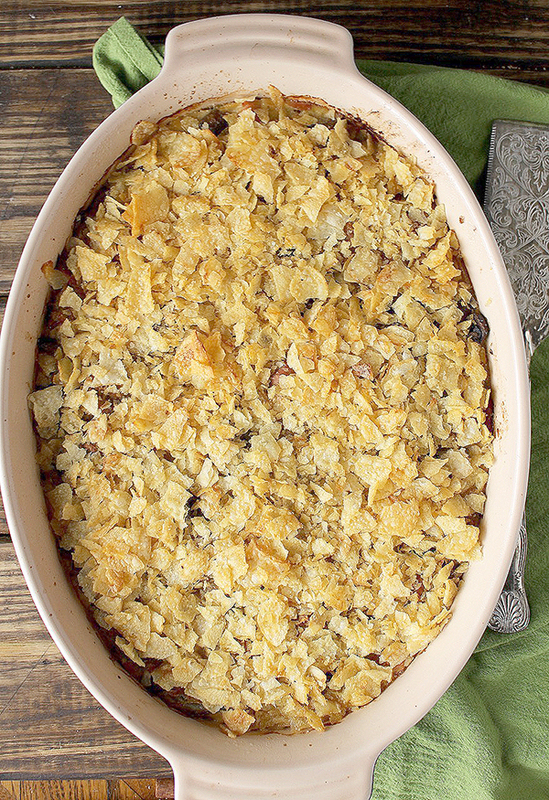 Crushed on top, they give the perfect contrast in texture and is reminiscent to the classic casserole topping. You’ll love how easy this is to make. It does involve a little prep work, but it’s not hard and totally worth it. Here is a how-to for cooking spaghetti squash– you’ll love that method. I like to use a big enough ban for the sauce where I can then mix in the tuna and mushroom sauce right in there. That’s one less dish I have to wash.
Ok- there is my not-so-beautiful picture of a scoop. I was hesitant to put that up, but my husband said it looked good so I’ll just go with it. Just remember– it tastes great! My other two spaghetti squash casseroles are 2 of my most popular recipes on my site. Paleo Baked Spaghetti and Buffalo Chicken Casserole. Both Paleo & Whole30 and so delicious. I hope you all love this one just as much! Here is a reminder how to cook spaghetti squash if you need it. My favorite method. Place the spaghetti squash in a large bowl and press excess water off with a clean towel. Preheat oven to 400° and line a 13x9 pan with parchment paper. In a large pan, add the coconut oil, mushrooms and onion and cook over medium heat until veggies are softened, About 10 minutes. Add in the thyme, garlic powder, salt, coconut cream and arrowroot powder. Cook for about 5 minutes, until mixture starts to thicken. Turn off heat and add in tuna, spaghetti squash, and eggs. Remove and top with crushed chips and bake for 5-10 more minutes. I found the coconut cream to make the dish too sweet. Maybe next time I will try plain Greek yogurt. Any thoughts? Hi Mimi- I’m sorry it didn’t work out. Are you sure you bought unsweetened coconut milk? It’s usually in the ethnic aisle. There is also a coconut milk sold by the alcohol that is for mixed drinks. It shouldn’t be too sweet, but you can try greek yogurt if you tolerate that okay. Or cream cheese maybe. Hope that helps! 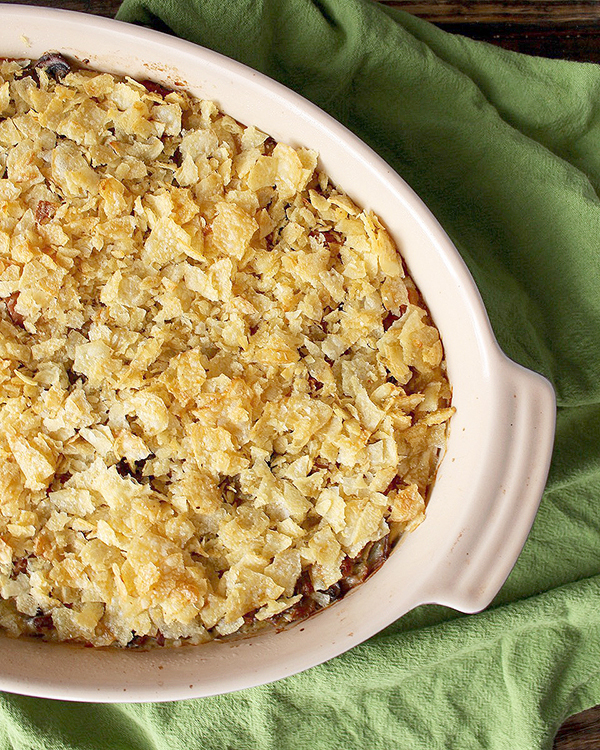 This is a yummy casserole and even better the next day! I had roasted 2 medium spaghetti squashes earlier in the week and ran out of tomato sauce to put over them – also happened to have a ton of mushrooms in my fridge and tuna is always in my cupboard so this was the absolute perfect recipe to use up those ingredients. Love the idea of a spaghetti squash based casserole. Casseroles are so comforting but usually loaded with garbage ingredients – yours are full of veggies and free of junk. Will be trying your buffalo chicken casserole next week! Hi Kristine- you can leave them out, the casserole will just not hold together as well, it will still taste the same. I hope you try it! Made this recipe for dinner tonight- my 19 month old and I loved it!! I think next time I’ll double the coconut cream- our spaghetti squashes are mammoths 😳 and I’ll add spinach!! Overall, filling and flavorful! Thanks for trying it, Kathryn! I’m glad it was enjoyed!